CLICK HERE TO GET ACCESS TO YOUR SOLAR SYSTEM SALES MODEL NOW! If you've failed with goal setting and New Year's resolutions in the past, it's not your fault. You didn't have this system to teach you the best way to get your whole brain engaged in the process. Now, you do. Rebecca Bardess will teach you how to create goals and habits for 2019 that honour every aspect of who you are. Building an empire is so 2011. In 2019, you will build a universe. YOUR universe. This easy system will show you how you can finally set goals & resolutions that make sense to you. Balance work, life, family, spirituality, and everything else that matters to you. Attract your ideal clients and team members, and get repeat business. Stop Building an Empire. Start Building a Freaking Universe! Click the button to get the training program now and start creating the life you have always wanted, but never knew how to manifest. The opportunity is right here, right now... You just need to take it. Audio training in bitesized chunks that you can consume at once, or go through in a week... or longer, if you like. Take it in your own time. Download them and put them on your phone if you like multi-tasking. 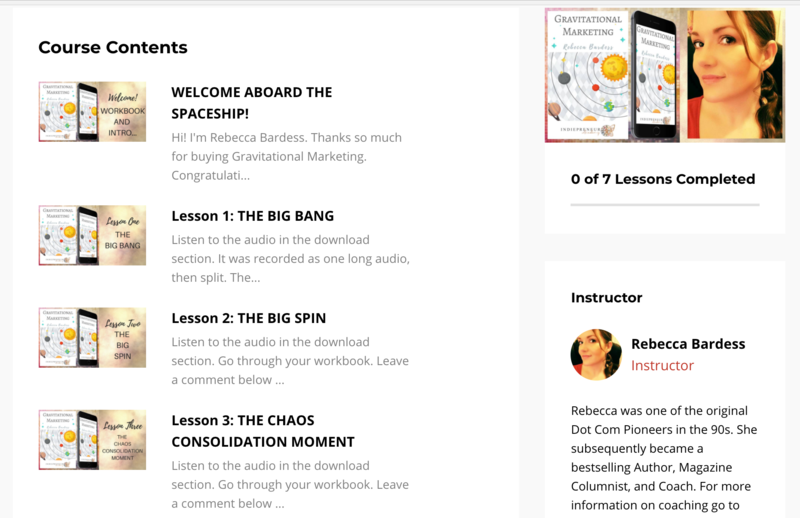 A workbook with notes from the course, and space to make your own notes. Use it as an online resource, or print it out. Up to you. An assessment to test your Gravitational Marketing knowledge that you can keep taking until you totally understand the model. Resources to help you reach your goals and have your best year yet!